If you are a photography hobbyist and is looking for a tool to process RAW files, RawTherapee is strongly a recommended tool. It’s a cross-platform tool so no matter the operating system you use, you will be able to install it on your computer and use it. You can use RawTherapee as the gate on your photography workflow. You can use it open your RAW files and then transfer it to the more sophisticated photo editing tool (like GIMP and Photoshop) for a further editing. RawTherapee is free to use. It’s an open source software released under the GNU General Public License Version 3. This brief tutorial is intended to help you how to use the tool. The very first thing you need to do before being able to use RawTherapee is obviously taking a learn its interface. RawTherapee comes with a dark interface. If you don’t like its default interface, you can change it to match your taste. RawTherapee provides 13 different themes you can choose from. There is a more crucial thing you need to learn than theme, the layout. The interface of RawTherapee is divided into three parts. The left panel is used to browse the RAW files from computer, the center area is used to display the thumbnails of the RAW files and the right panel is used to make all of the adjustments. 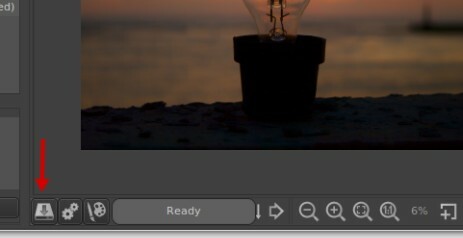 The center area will turn into a photo editor once you open a photo with the aim to edit it. The thumbnail viewer (center area) features several parameters to filter the shown items. This feature is handy if you have too many photos to be edited. You can filter the thumbnails by such parameters as rating and color label. RawTherapee is not a photo management tool like Darktable or Lightroom so it has no features to manage the RAW library. Before being able to select a RAW file to edit, you need to add a folder where the RAW files you want to edit are located. For this, you will first work with the left panel. On the upper side on this panel, you will see three vertical tabs: File Browser, Queue and Editor. On the “File Browser” tab, you will see folder selector on the lower side. Browse a folder where you store the RAW files you want to edit and double-click on it. 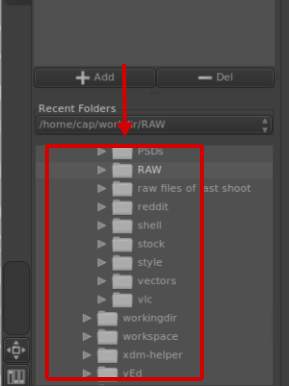 RawTherapee will bring folder contents (RAW files in this case) to the thumbnail viewer (center area). 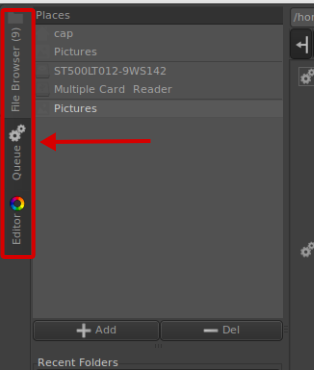 There are two ways to open a RAW file in RawTherapee: by double-clicking it or by right-clicking it on the thumbnail viewer and select the “Open” option. 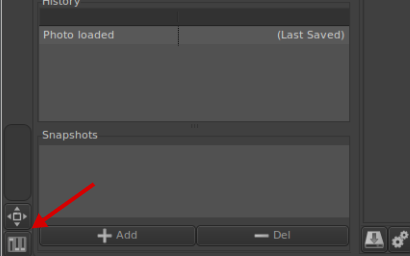 You will automatically switch to the “Editor” tab every time you open a RAW file. RawTherapee is aimed at RAW post-production so that the tool features a bunch of tools to allow you making adjustments to get the best tones for your photos. Once you open a RAW file to edit, you can switch to the right panel. There are six main tabs you will work with: Exposure, Detail, Color, Transform, Raw and Metadata. Each tab contains several parameters you can adjust. For instance, if you want to adjust the white balance, you can go to the “Color” tab. There are much adjustments you can adjust, which will be too long to discuss them all here. But for an example, I am going to demonstrate how to adjust the saturation. You can find the saturation setting under the “Exposure” tab. For a more detailed about each tab you can read this wiki page. Keep in mind that RawTherapee is a non-destructive photo editing tool. This means, all of the changes you made won’t really be applied until you export the associated photos. RawTherapee store the setting information in sidecar files with the extension of .pp3. You can hide the left panel as well as top panel to get wider editor. There is also a zoom in button you can take advantage of. You can also hide the exif into that appears by default every time you open a new photo. If you have used Lightroom or Darkroom before, you must already familiar with presets. Presets are used to store the settings you have made and are intended for recurring use. The main idea of presets is to save you time since you can apply the same presets on different photos. This way, you can edit a photo more quickly. RawTherapee also comes with this type of feature. It’s just, the name is different. Instead of preset, the feature is called processing profile. Once you got the the best tone for a certain photo, you can store the settings to apply them on the similar photos on the next editing. To store the processing profile, you can click the arrow button on the right panel. Processing profile will be saved in a text file with the extension of .pp3. To open a the stored processing profile, you can click the folder icon right next to the arrow button. RawTherapee itself also provides several bundled processing profile which you can access from the dropdown menu next to the folder icon. RawTherapee allows you to make the same adjustments to multiple photos at once. To do so, you can press and hold the CTRL button on the thumbnail viewer while selecting the photos you want to make the adjustments of. However (at the time of writing), RawTherapee hasn’t supported bulk export. 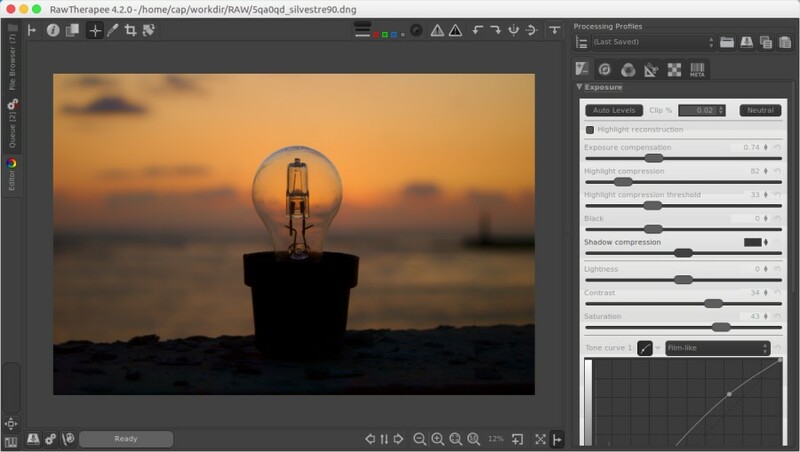 To export a photo, you need to open it first to take it to the editor. You will see an arrow button below the editor panel. Simpy click the icon to export a photo. There are three image formats you can select: JPG, PNG and TIFF. As I said earlier, you can use RawTherapee as the gate on your photography workflow. While you can use RawTherapee to make the adjustments on your photo, you might want to perform further editing like blending a photo with another photos or anything. 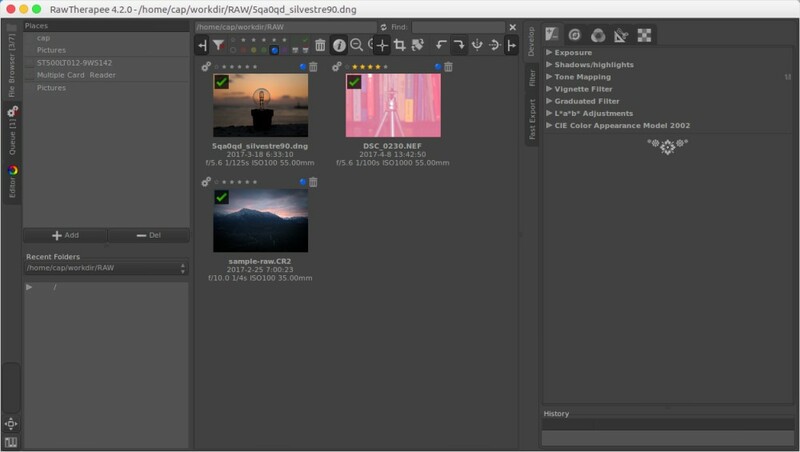 RawTherapee itself uses GIMP as the default external photo editor, but you can change it in case you have other photo editor installed on your computer. 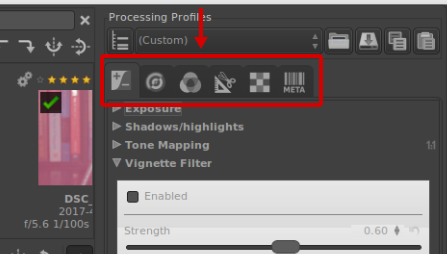 On the editor panel of RawTherapee, you will see a palette icon below the photo you are editing. 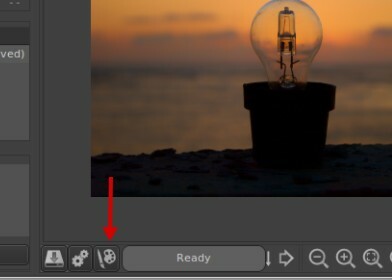 You can click the icon to transfer the current photo to the external photo editor. RawTherapee will convert the RAW format to the photo editor-recognized format (TIFF) and launch the photo editor for you. 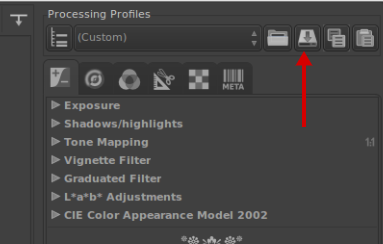 You can change the default external photo editor (GIMP) from the “Preferences” menu which you can access by clicking the mixer icon on the bottom-left corner. This article uses RawTherapee version 4.2.0 as the example. If you haven’t installed RawTherapee on your computer, you can download the binary file on its official site.